If I were into one-word reviews, this one is “charming.” If I’m allowed a second word, it’s “utterly charming.” But I’m rarely so concise. This is the delightful story of Madeleine, whose neglectful parents send her to her uncle’s restaurant to work every summer. Madeleine loves to cook, but Uncle Lard (characters have food-related last names, which adds to the fairy-tale feel) treats her as Cinderella. 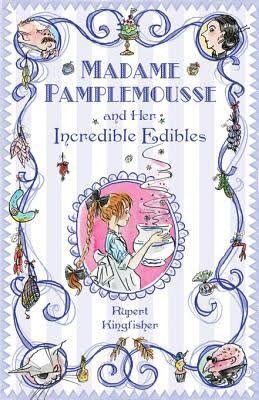 One day, he sends her on an errand to buy more pate, and she stumbles upon Madame Pamplemousse’s otherworldly shop, which is filled with exotic delicacies. Monsieur Lard becomes obsessed with finding out Madame Pamplemousse’s secrets and sends Madeleine as his spy. What will she find out and, more importantly, how will she use the knowledge? This reminded me of a shorter Roald Dahl book. Even the little drawings are reminiscent of Quentin Blake’s illustrations. It has a timeless feel, a larger than life villain, a discovery of something magical, and a plucky heroine. Lilah and I both loved it. Character last names are a bonus treat for anyone with a little knowledge of French, and Paris is beautifully evoked. This was a delightful read-aloud, both sweet and a little gross (just like Dahl). Source disclosure: This book was received as a gift.